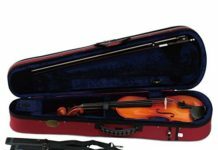 Violins and violas are delicate instruments so you want to make sure that they are always stored properly, but sometimes storing them in their violin or viola case can be cumbersome, especially if you are only setting it down for a minute. 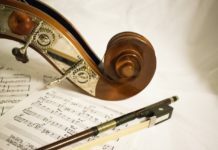 You may typically set your instrument down on a chair during rehearsal, but this is fraught with risk if someone walks by and knocks your expensive instrument onto the floor. Another alternative is using a violin/viola wall mount or hanger. These convenient devices let you hang your instrument from either the wall or your stand so that it is held securely out of harm’s way. 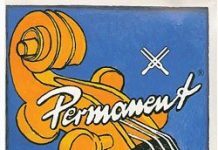 Below we’ll show you the best wall mounts and hangers for violins and violas. 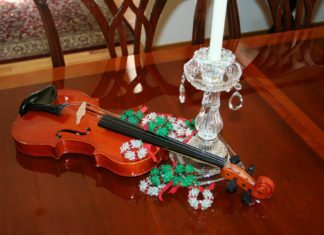 The String Swing CC01V-BW violin/viola wall mount is a beautiful way to hang your instrument. It has great padding and a hook to hang your bow as well. If you’re looking for a great violin or viola stand that is both affordable and durable, the Stagg SV-VN stand is for you. 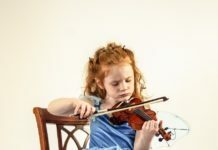 While it’s not as pretty as some of the other violin and viola stands on this list, it is the most practical. You don’t want your instrument to be damaged by lack of padding on the wall mount or stand. We recommend looking for non-marring rubber to provide the best protection. The worst thing that could happen after you hang your violin or viola is that the stand collapses or the instrument falls off the hanger. To minimize this risk, look for violin/viola wall mounts and stands that are made from durable materials and is designed in a way to minimize falling over. This elegant violin/viola wall mount will look great on your wall and provide a safe place for your violin or viola to hang. The unique design prevents your violin or viola from resting on its tuners and the padding protects the finish. The right hook also has room to hold your bow so that you can have everything you need to start playing within seconds. This is a great way to show off your beautiful instrument. The Moreyes violin (or viola) wall mount is a classy way to show off your instrument. The mount part is designed in the shape of a violin so even if the violin or viola isn’t present on the wall, the use of the mount is obvious. 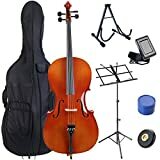 It also comes with the bow mount like the String Swing violin wall mount above as well as a violin-shaped keychain as an added bonus. If you want to use a wall mount that is a bit more stylish than the String Swing mount above, give the Moreyes Violin Hanger Wall Mount a try. The most elegant violin or viola stand on this list, the Zither Wooden Stand makes a great statement piece for any living room or music room. 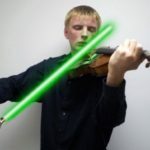 Show off that you play violin in style. The stand features the same sturdy cradle by String Swing so you know that it will hold your violin or viola. The base is made from quality Mahongay and cut/assembled in Brenham, Texas so you know it is made with American quality. 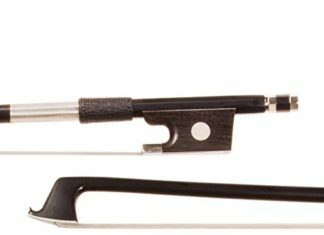 While originally designed for electric guitars and basses, this hanger by Top Stage also works for violins and violas. If you’re looking for a low-cost way of hanging your violin or viola, this is a great option. 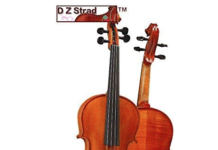 The arms in the cradle are flexible enough to hold any size of the instrument and the non-marring rubber coating protects the finish of your violin or viola. We still recommend spending a little bit more for the String Swing wall mount above since it is meant for violins and violas, but if you’re on a budget this wall mount will work. If you don’t want to risk your instrument falling from any significant height, the Vio Music stand is for you. 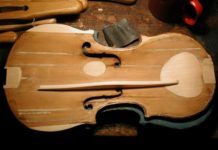 It’s elegantly crafted and will fit any full-size violin (no viola, unfortunately) and bow. 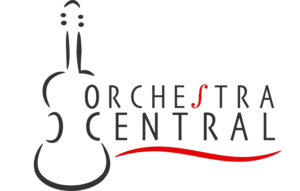 If you want to use a violin/viola hanger during rehearsal, String Swing also makes a hanger for music stands (or microphone stands if you’re doing an amped performance with an electric violin). The hanger screws on the bottom or top half of the music stand and will securely hold your violin or viola when not in use during breaks, etc.